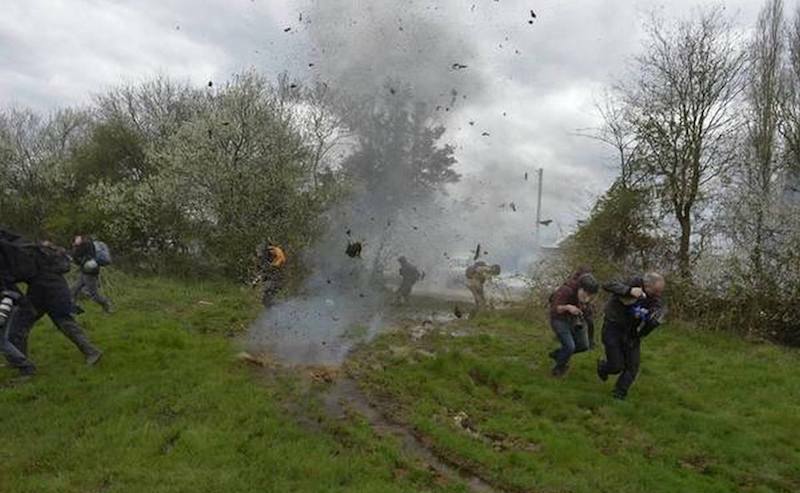 Zadistes flee a police grenade. via the Nantes Révoltée Facebook page. Kristin Ross's account of her visits to the ZAD was told to Eric Aeschimann and first published in L'Obs. Translated by David Broder. I first went to the ZAD in spring 2016, two years ago now. I was impressed by the mix of people — there were more women and elderly people than you generally find in this kind of space — as well as the variety of activities taking place. When we arrived in Saint-Jean-du-Tertre the discussion did not start right away because there was a herd of cows that had to be shifted from one side of the ZAD to the other. Then some horses escaped, and we went off to look for them. When we got back to the farm, it was time for the bread to come out of the oven and we also had to wait for the militants returning from Paris after they had taken part in the demonstrations against the Loi Travail. Finally, the discussion took place outside, around the oven, since the library on the first floor had not been built yet. I had been invited by the members of the "Mauvaise Troupe" collective to talk about my book on the imaginary of the Paris Commune, which had just come out in French. How could we build "communal forms"? That was the question that they were asking, and indeed they used the original English title of my work, Communal Luxury. This formula circulated through the world of artists and artisans during the Commune: not just to share out the cake in equal slices, but to share out the very best. Some of those attending had a developed literary erudition and others were autodidacts. Across the ZAD as a whole, there were of course tensions. In the general assemblies the university-educated were regularly criticised for how ready they were to make pronouncements about everything, and risk silencing the others, even if not on purpose. Another fracture line set the longstanding farmers against "naturalists" who say that humanity should stop interfering with nature: we should stop touching a single branch in the forest. More incidentally, another dispute concerned the presence of dogs. For some, a ZAD sets everyone free, including dogs; others said that they were bothering the livestock. I have been back six or seven times, for my own pleasure. I like the relationship with time that you feel at the ZAD. This has nothing to do with capitalism’s temporality. At the ZAD you work a great deal, but not for a wage, and that really changes everything. You have to take care of the animals, the crops, the children. People there are always busy, building, extending, and refitting their living spaces. They have built collective buildings as well as more playful installations, including a lighthouse. A lighthouse in the middle of the fields, erected and carefully maintained: a fine example of communal luxury! The days are also occupied by political and cultural activities. This is what "Mauvaise troupe" calls "compositional" activity: taking the time to learn how to live together, with all the sensibilities this involves. Doing that relies on the general assemblies, which can last as long as six hours. Seeing this from afar, one might be tempted to raise a chuckle, but when you live these moments on the ground you admire the energy that is being devoted to inventing a different life. In their embrace of a form of "poverty," I see an impressive freedom. They limit their needs, prioritise collective labour, and learn to be autonomous. As compensation for that, they have a certain richness of life. Of course, here we can think back to pre-capitalist communities or even to Franciscan communities, but without the religious dimension. You eat very well at the ZAD, except when there is a lack of food; people love to cook together. I slept in a caravan. In winter it was sometimes freezing, but other sites are heated. The government has made out that it is dangerous, there. Like anywhere there may be some individuals who pose problems, but the ZAD has a mediation system: each month, a dozen people are chosen by lot as mediators. This accumulation of experiences, of solidarity, of all that was shared, makes up the ZAD’s most precious resource. We began by defending a territory, and gradually what we did together there became as important as the land itself. Building solidarity between different people is very much what we need today. I was in La Rolandière when it was announced that the airport construction project was being called off. Everyone jostled to see the footage of this historic decision on a tiny computer screen. We did a lap around the ZAD to thank the farmers who took part in the struggle, and then organised a big party. But after that, the state sought to divide the zadistes. Of course, there were internal disagreements on the future course of action. Some favoured reaching a compromise with the state while others adopted a radical position, a pure anarchism, even at the risk of impotence. Rather than a firm majority decision or everyone just going off to do as they pleased, they sought a middle position. The discussions were sometimes difficult and they took time. Again, this was the idea of "composition." But the state did not want such an experience to develop. What happened last week was dramatic. There was nothing but pollution, gas, and mud everywhere! The gendarmes did not just demolish the site but sullied it. Even the animals were affected by the teargas and roamed off into the forest. It was as if for want of being able to build its airport, the state nonetheless managed to plunder the territory. What is Emmanuel Macron so afraid of, that would lead him to act so violently? I think it is that today living a different, free way, a little outside the system, constitutes a threat to neoliberalism. We have to defend these spaces that stand "outside the system." The radical Left often waves around the word "resistance." But to resist is to admit that you have already lost and that you are faced with an enormous, invincible power. I prefer the idea of "defence," which is at the heart of the ZAD experience. We defend when we already have something, which we cherish and are holding on to. The ZAD was not a utopia, but a community that has been functioning for ten years. That is what the French government wanted to destroy. As it happens, this same government contacted me last October, via the intermediary of Sylvain Fort, Emmanuel Macron’s advisor on "Discourse and Memory." He wanted me to come to the Elysée [presidential palace] and talk to him about ’68. A colleague of his wrote to me, saying that "on the fiftieth anniversary of May ’68, the President wants to take part in the national reflection that shall surely extend across the whole course of 2018." In her email, the events of ’68 were associated with themes like "modernisation," "impasses," or even "the collapse of utopias that resulted." This is the classic narrative according to which ’68 exhausted and then buried the last revolutionary illusions, and that now for want of alternative we should give up on changing the world. Yet in my own work as a historian, I have shown that ’68 invented new forms of action which movements like the one in Notre-Dame-des-Landes still feed on even today. I do not believe in the idea of "impasses" and so I declined the Elysée’s invitation. Later, I saw that the French president had decided against speaking at the fiftieth anniversary events. I think this was the right decision. For to claim the heritage of the May uprising at the same time as sending tanks to Notre-Dame-des-Landes would have been the height of what ’68 feared most: a cynical recuperation of the struggle.